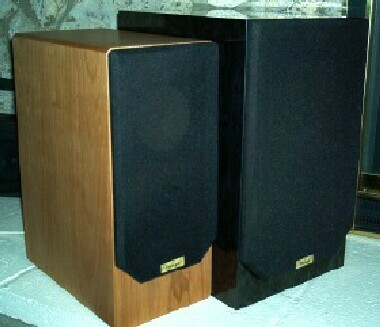 In late 2002, I reviewed a pair of speakers from Omega Speaker Systems, model TS2R. The review was well underway when Louis Chochos, President of Omega, sent one pair each of the Omega TS1 Standard and TS3 Standard speakers for evaluation and comparison. I was more than happy to compare two more pairs of Omega Speakers to each other and to other offerings in the same price class, though it was not practical to include them in the original, comprehensive TS2R review. What are the TS1 Standard and the TS3 Standard? All speakers in the Omega TS Standard line share common design features including use of a Fostex FE, full-range driver in a bass-reflex cabinet. All the cabinets have similar construction, including ladder bracing, very sturdy structure, and the use of Black Hole 5, a sound deadening material used to eliminate sound reflections directly behind the drivers. While overall construction of the Standard is nearly identical to the R model, the Standard model lacks the cabinet resonance reducing R-compound (asphalt-vinyl composite), Cardas Patented Posts, Cardas Litz internal wiring, and damped ports of the R model. The TS1 Standard is the largest of the Standard models. This loudspeaker uses an 8-inch Fostex FE207E driver in a cabinet that measures 41cm high, by 24cm wide, by 30cm deep (16 x 9.5 x 12 inches) and weighs approximately 11kg (24 lbs). A pair of tuning ports is located on the front baffle beneath the driver. The TS3 Standard is much smaller. It uses a 5-inch FE127E driver mounted high on the front baffle above a single tuning port. The cabinet measures 37.6cm high, by 16.5cm wide, by 28cm deep (14.8 x 6.5 x 11 inches) and weighs approximately 5.9kg (13 lbs). The binding posts of the sample TS3 are located in a small plastic cup on the back of the cabinet. The TS1 did not use a cup, the binding posts extended through the back of the cabinet. They looked similar to Cardas posts used on the TS2R, but were not of the same quality. 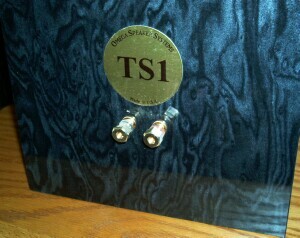 Louis Chochos said all new Omega Standard speakers will use binding posts like the TS1 - the cups are no longer used. The price of the TS1 Standard is $699 per pair; the TS3 Standard is listed at $399 per pair. I noted the excellent finish of the TS2R, but expected that the less costly, Standard models would have reduced finish quality commensurate with their lower prices. I was wrong. The TS1 and TS3 are finished every bit as well as the TS2R. One aspect of the veneer finish that is common on all three Omega models - the veneer was applied on all sides, including the back and bottom. The TS3 had a natural, oiled Beech finish with perfectly applied veneer. The TS3 loudspeaker, like the TS2R, would fit well in many different décor. They truly are beautiful to look at. Pictures, especially the low-resolution web photos in this review, do not do the Omega Speakers justice - in photos they look like any other speakers, just simple boxes. In person, the quality of construction and the gorgeous veneer stands out. The finish was even higher quality than my Reynaud speakers. 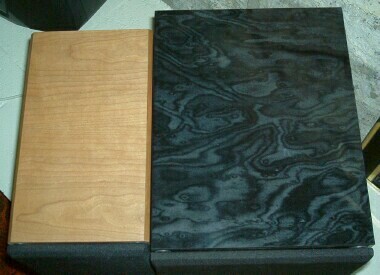 While the TS3 had natural wood veneer, the TS1 had a unique finish called 'Black Maple Pearl'. This is a laminate veneer that is difficult to describe. In dim light, they are simply very dark, almost black with barely discernable variegation. In bright light, the variegated medium and dark grays have an almost pearlescent sheen. The finish is glossy and absolutely flawless. The wife acceptance factor (WAF) of this pair of speakers was the highest of any I've had in the house, including any I own. 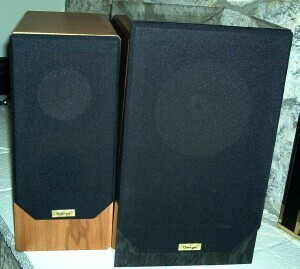 No matter how beautiful the Omega speakers are to look at, they would be worthless if they didn't sound good as well. The TS1 and TS3 match very well with vacuum tube gear. They also worked quite well with two solid state amplifiers that were available for use. As with many single-driver speakers, they excelled at rhythm, pace, and timing - and, there was no issue with drivers being out of phase since there was only one per box with no electronic crossover to confuse the issue. One word sums up the sampled Omega offerings: musical. Matching them with an equally musical front end and amplifier produced delightful results. There are other loudspeakers in their respective price classes that have superior specifications, and would, no doubt, be more satisfying for an audiophile. For example, a pair of B&W DM 601S2 loudspeakers, which is similar in size and price to the TS3, has slightly better treble and bass extension and greater power handling capability (although the TS3 is substantially more efficient - 88dB/1 watt/1 meter for the B&W vs. 93dB for the TS3). When listening to the B&Ws, everything seems to be there, no problems are obvious. They are tonally correct and have great detail. Yet, while technically excellent and brilliantly refined, the DM601s simply do not elicit the type of visceral response that can be achieved with the TS3. Given appropriate sources and amplifiers, the TS3s are simply more involving. The TS1 works similarly, although with much deeper bass and richer sound. The TS1 and TS3 have many family resemblances, both to each other and to the TS2R. This is to be expected since their overall design and implementation is nearly identical. All three are very musical speakers that are quite forgiving about their placement and environment compared to some other speaker designs. As noted with the TS2R, while detail is very good, it falls short of the extremely detailed, highly revealing quality of some speakers. This is not a complaint, simply an observation. Some speakers can be so detailed, that everything in the audio chain, from recording to cables, from source to amplifier, must be excellent or all flaws will be magnified. The Omegas fall short of this type of precision. However, this results in the Omegas working better with a wider variety of equipment and recordings. Omegas speakers don't seem to 'hide' aural flaws in the system - they simply don't highlight them. 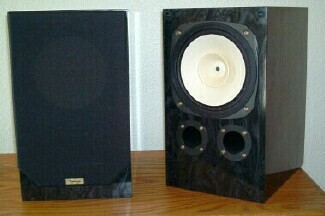 Different finishes on the two Omega speakers. There is one other family resemblance in all three speakers regarding the Fostex full-range drivers - these drivers require substantial break-in time before they begin to sound their best. The TS1 and TS2R sounded somewhat congested and uneven until they had been played 40 or 50 hours. They didn't sound terrible, they just didn't sound right. The TS3, however, sounded dreadful. It was very inconsistent, ranging from clear and open to muddied or muted. Do not despair, simply play them for at least 50 hours (100 would be better) and don't bother listening until after they are broken in. Despite the similarities, there are also substantial differences. The TS1, which uses an 8-inch Fostex driver, has rated frequency response from 49Hz to 20KHz. The usefulness of Fostex's claim of 20KHz for the FE207E is somewhat questionable, although the whizzer cone does an acceptable job of high-frequency dispersion without creating a terribly annoying 'shout' or peak as do many whizzer cone-equipped drivers. There is a peak in the upper mid-range, but it is quite subdued compared to some other whizzer-cone drivers, such as most Lowthers. High-frequency performance is very good even off-axis resulting in a 'sweet-spot' much larger than would be expected for an 8-inch, full-range driver. High frequencies are clean with surprisingly good transient response. Cymbals and bells sound like the instruments they are, with clear, ringing tones. While this may not seem to be much of an achievement, I have heard several more expensive speakers with dedicated tweeters fail to achieve realistic-sounding high frequency tones. Though the TS1 cannot match the treble performance of many high-end, multi-driver loudspeakers, its excellent coherence across the audio spectrum helps make up for it. Mid-frequency performance is very good, rendering vocals cleanly and without nasal or chesty artifacts. However, the mids fall somewhat short of the detail and realism of the TS2R or the competitively-priced Hornshoppe Horns. While the quality is good, sometimes the mids sound a little recessed - not much, but it is noticeable. When making direct comparisons between the TS1 and the TS2R or some non-bass reflex speakers, the TS1 sounds a little bit like a box - there is a vaguely hollow sound, although that impression is not a strong one and is only really observed during comparisons. When listening to the TS1 exclusively, the 'box-sound' was not an issue. A look inside the TS1 cabinet revealed that the cabinet immediately behind the ports is bare - it has no Black Hole 5, no acoustic filler, and lacks the cabinet coating of the R models. It appears that some mid-frequency leakage may reflect off the inside of the cabinet and issue from the ports - this could account for the somewhat reduced mid-range performance of the TS1 compared to the TS2R. The TS1 has strong, usable bass down into the mid-40Hz range, which is substantially lower than the TS3 or TS2R. No, this 8-inch, full-range driver will not reproduce the low end of a contrabass or pipe organ - a subwoofer will be needed to fill in the lowest octave or so. Bass sounds generally quite good, but lacks the sharpness of the TS3 or the clarity of the TS2R. Although lacking the bass quickness of the smaller TS speakers, the TS1 bass is still clean and accurate, more so than many competitively-priced multi-driver speakers, but it sounds slightly soft compared to its siblings. However, there was no boominess or muddiness and no trace of overhanging notes. The soundstage is fairly large, but not very deep. Imaging is good, although not in the same class as the TS2R or TS3. After comparing the TS1 and TS2R, benefits of the R model became very clear. Despite minor shortcomings of the TS1 compared to other TS models, there is a very strong impression of better tonal balance, richer sound, and a more complete audio spectrum combined with a very musical presentation. For the type of music I prefer, the TS1 simply sounds right. While experimenting with the TS1s, I connected them to a Fi X using a pair of ZERO Autoformers and multiplied the impedance by 2x - the nominal impedance 'seen' by the amplifier was then 16 ohms. Bass was slightly cleaner, sharper, and better controlled. Bass transients were a bit quicker; even mids were more crisp, better detailed, and seemed a bit more forward. A solid state amp provided even better bass control, but lacked the clarity and smoothness in the mid-range and treble compared to the Fi. The TS3, which uses a 5-inch Fostex driver, sounds brighter and thinner than the TS1. High frequency performance is superior to either the TS1 or TS2R. Treble transients seem quicker, and prolonged high frequency notes, such as the ringing of a triangle, seem to sustain and decay more realistically than do the larger speakers. High frequency dispersion is quite good - a pair of TS3 speakers can fill a room with treble allowing for a very large sweet spot and a convincing soundstage that doesn't collapse unless the listener moves well to the sides of the speakers. Mid-frequency performance of the TS3 was very good, delivering even cleaner and more detailed sound than the TS1, although the TS1 mid-range sounds more open and somewhat more natural. The impression that the TS3 sounds brighter than the TS1 is because the latter reaches about 20Hz deeper than the former. As expected with the smaller driver, the TS3 has cleaner bass with quicker transients and more detail than the TS1. Although useful bass only extends down to the mid-60Hz range, it is clean and clear with no trace of overhanging notes or boominess. While the TS1 benefitted greatly by use of the Zero Autoformers as impedance multipliers, the TS3 did not. To make the TS3 work exceptionally well required integration with a subwoofer. A Hornshoppe Hornline, a powered, hybrid rear-loaded horn / transmission line cabinet with a 5 1/2-inch driver, was pressed into service. After some tweaking, the most impressive setup for the TS3 was found to be a Decware Zen Select amplifier, Zero Autoformers in 1/3x mode (2.7 ohms), and the Hornline connected by high level input to the Zen, and set to crossover at 60Hz. This combination provided an absolutely seamless and wide frequency range from crystal clear and clean highs, to quick, clean bass down to 30Hz, with excellent soundstage and superb imaging. Of course, this combination was substantially more costly than the TS1R , ($1099) or other offerings by Omega Speaker Systems, including the MiniMax combo (TS3 Standards with a powered subwoofer, $899), or Omega's new, larger-sized, TS3 Grande ($549). The True Sound line of speakers made and marketed by Omega Speaker Systems covers a range of prices from $399 to $1,099. All sampled models are characterized by an aural presentation with great appeal for music lovers rather than being designed for audiophiles. Each of the TS speakers has advantages and disadvantages. The TS3 has the best imaging, greatest detail, quickest transient response, and lowest price. It also lacks low bass. The TS1 has the deepest bass, full, rich, sound and is tonally very well-balanced. The TS1 also has the slowest bass transients sometimes giving bass a 'soft' sound. While imaging and detail are not equal to the TS3, the TS1 mid-range, particularly vocals, seems more open with slightly stronger presence. The TS2R demonstrated the value of upgrades in the R models. While bass was not as deep as the TS1, it did reach deeper than the TS3. However, bass was nearly as clean and quick as the TS3, and mid-frequencies were more open, more clear, and more substantial than the TS1. While the True Sound Standard models work very well and produce a musical output that can be very satisfying, the R models refine the output and take the TS speakers to the next level. However, as with many worthwhile audio upgrades, they do so for a price. All Omega loudspeakers are also characterized by exceptional build quality and superb finish. This allows these little speakers to proudly take their place in well-decorated living rooms, something many competing speakers, high-efficiency or conventional, cannot do well. The Omegas are an excellent match for low- to moderate-powered, single-ended and push-pull valve amps, and they also work quite well with solid state amplifiers. While there are other high-efficiency loudspeakers competing with speakers from Omega, the TS line of loudspeakers don't stand out from the crowd due to outlandish design or huge size, nor will they appeal to hard-core audiophiles. They stand out because they have a wonderfully musical presentation, they are finished like fine furniture, and prices of all models in the line are reasonable and more than competitive. There are numerous options available with Omega loudspeakers, but with all Omega models that I've had the opportunity to sample, great value is a standard feature.